Are you manifesting your beauty from the inside out? We can access our inner beauty by balancing our minds and our emotions which, in turn, affects our health and our overall radiance. Have you ever met someone who is intrinsically beautiful — they just glow from the inside out, but it has little or nothing to do with his or her physical appearance? In Oriental Medicine dating back to Taoism, this inner radiance is described as “Bright Shen” or “Significant Shen,” meaning bright spirit. These individuals are lit from within and easily display this quality through their eyes. How can the rest of us access our inner beauty? We do so by balancing our minds and our emotions which, in turn, affects our health and our overall radiance. These five emotions were called the rebels of the body and needed to be kept under control: fear, radiating from the kidneys; anger, activating in the liver; joy, emanating from the heart; worry, stemming from the spleen/stomach; and sorrow or grief, originating in the lungs. All these emotions are necessary and have value when used in balance; however, overuse or underuse of these basic emotions can damage the specific organs which control them. Each of these major emotions also affects the face in specific ways. For example, dark circles under the eyes can indicate depletion in the kidneys as a result of overusing fear. When anger is overused, it can create deep lines between the eyebrows. Worry can cause the chi to stagnate, resulting in unclear thinking and incomplete digestion. The eyes appear to have a lost, glazed or unfocused look. Too much excitement in the emotions can lead to chronic redness in neck, throat and face. Grief can show as a deadness of the shen, where the eyes do not sparkle. Feeling, expressing or repressing these emotions all affects the body and eventually the face, influencing our overall beauty. 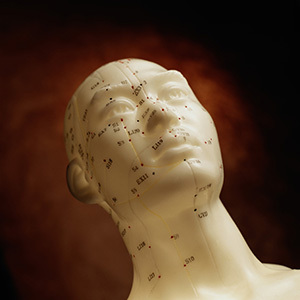 Chinese modalities use shiatsu (finger pressure) or acupressure on key points of the face and body to unblock or balance the energy of the organ systems. Other modern modalities used to balance the emotions include aromatherapy based on the five elements, as well as diet based on the five tastes. It is important to examine the modalities and tools used to nurture and encourage the manifestation of beauty. By exploring the five elements in depth, we can investigate how they pertain to the physical energy of our organs, how they manifest physically on the face, and how to determine our well-being on all levels: mentally, emotionally and spiritually. Deborah Thum holds an associates degree in holistic health care and is a licensed esthetician, clinical aromatherapist, life coach and is versed in many Asian healing arts. 480-539-6646 or www.trueharmonywellness.com. ← Why am I thinking?